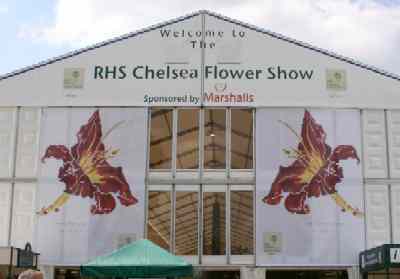 KH spent Tuesday at the Chelsea Flower Show, photos will follow as soon as we've looked through, sorted and captioned, the 100 or so taken! However Tuesday was not so good in North Yorkshire on the plant front. There was a very harsh air frost overnight, with temperatures down to almost -6°C in some gardens, TB lost all her beans and half the potatoes and reports of plant losses in Goathland are mounting, ranging from begonias to gunneras. Thankfully our gunnera manicata was only scorched and the fatsia japonica isn't looking too happy either but both should make a full recovery. BUT the sweet peas are definitely looking the worse for wear and this is nothing to do with the frost but more to do with Labrador damage. Maia is an odd dog and for years has hunted out and eaten dandelions down to the root; just recently she's moved onto soil, especially that nice, soft, newly turn earth around tender seedlings like sweet peas! With this in mind a large quantity of cat pepper was incorporated into the planting pockets, a drench of rain and the frost removed the smell from the surface just enough for her to get her nose in and start eating, then the pepper did it's stuff but by then she'd got the taste so out came the peas and digging commenced searching for 'clean' soil. Hebe found uprooted peas a wonderful toy to toss around the garden and she's not averse to a bit of digging. Upon hearing this news Niall offered Flag's services, "Flag is now running day release courses (NVQ Level 3) in Open Cast Mining, and in Canine Archaeological Digs and welcomes Beginners and Improvers, so do let Maia (& Hebe) know. They may be interested in sitting at the paws of The Master Digger & learning how to improve their technique..."
Despite all out plant induces traumas we've put together a CJS weekly just for you, it's 15 pages containing 121 new paid posts of which 51 came direct to CJS. It is now dropping off the printers and will be on it's way to you soon. Please remember Monday is Bank Holiday so postal copies will be a day late and should arrive on Tuesday.